While visiting Santorini, a must-do activity is one of the well-organized daily trips or tours around the volcanic islands of the caldera. It is a great opportunity to become familiar with the wild natural beauty of the island and the volcano that changed the history of Mediterranean civilizations thousands of years ago. 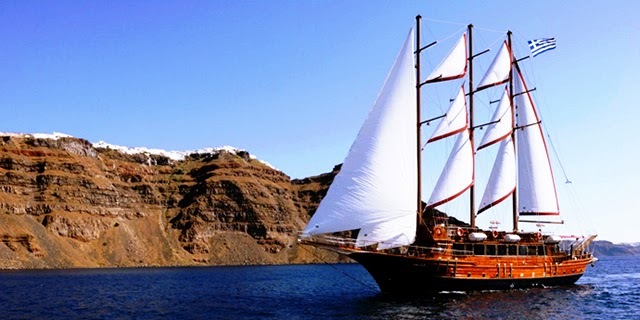 The tour usually starts from the Old Port of Fira, from there you will sail to the Island of Nea Kameni where Santorini’s famous volcano is located. There you will have the opportunity to climb to the top of the (now dormant) volcano, see the active crater and walk on the rim while a geologist will explain its long history. In Palia Kameni you can swim in the hot springs that were created thousand years ago by the power of the underwater volcano. Next stop might be Thirasia Island where you can eat in the picturesque small taverns next to the port or swim in the crystal clear waters. Returning to the island of Santorini you can watch the beautiful sunset with a glass of local wine under the rock of the caldera. Wine is undoubtedly one of the leading products of the island and Vinsanto (the local brew) is directly associated with the history of Santorini. If you have some spare time, a wine tour is another unforgettable facet of Santorini’s possibilities. Last but not least, do not forget the donkey ride! A great experience that will transport you to another era of the old Greece. Tradition dictates a donkey ride to the other side of Fira where you can watch one of the most famous sunsets in the world. You may have heard all about it, you've seen it in pictures, now it's time to experience the magic of one of the most magnificent sunsets in the world. Book now at Thermes Luxury Villas! Follow Thermes Luxury Villas's board One day excursions in Santorini on Pinterest.